Prof. Kurt Schmid was born on April 29, 1942 in Vienna into a family of musicians. In 1963 he graduated from the Vienna University of Music, where he studied clarinet with Prof. Rudolf Jettel. In 1963 he became solo clarinettist in the Lower Austrian Tonkünstler Orchestra, where he worked until 2003. He also played in ensembles, such as the "Wiener Konzertanten-Schrammel Quartett" the chamber music ensemble "Kollegium Viennese" and the “Wiener Terzett”. From an early date he started to compose. In 1970 he began his teaching career, and in 1974 was a lecturer in the Vienna Music Seminar; and in 1980 at the University of Music in Vienna. He holds master classes in Austria, Japan, Korea and the Ukraine. In 1993 he was appointed artistic director and conductor of the Vienna Clarinet Orchestra; and since 1996 the Artistic Vice President of the Wiener Musikseminar. In 1998 he founded the "Strauss-Gala-Orchester Wien", giving guest performances in Japan, Spain and Austria. In 1999 he was appointed honorary director and conductor of the Symphonic Orchestra of the Oradea State Philharmonic Orchestra. In 2002 Kurt Schmid's concert activities in the Ukraine started: where he conducts concerts all over the country. In 2002 he was appointed artistic director and principal conductor of the Academic Symphony Orchestra of the Lugansk Philharmonic Orchestra where he also teaches. He has toured Austria extensively with this orchestra, often accompanied by a choir. He has toured Austria with this orchestra extensively: most notable being performances in the Great Hall of the Vienna Konzerthaus, and in 2005 in the Wiener Musikverein, He has received numerous awards both in Austria and the Ukraine. 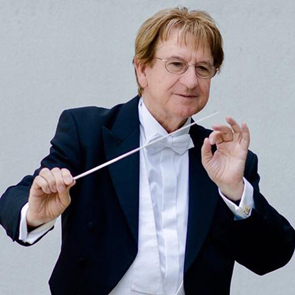 As a composer Kurt Schmid has written several hundred works for full orchestra, ensembles and military bands. His compositional highlight was the world premiere of his ballet The Fire Flower in 2007 at the Museumsquartier and later in the Redoutensaal of the Vienna Hofburg. Over his long career he has produced many CDs and our Society is pleased to be cooperating with him today in the production of a new series of CDs exclusively featuring his music.